The SonoScape A6v veterinary portable ultrasound is the ideal system to add to many types of veterinary clinics. 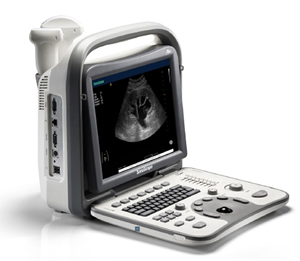 Additionally, as a laptop-sized vet ultrasound that weighs just 13 pounds, the A6v is widely used for field work and point-of-care situations.The SonoScape A6v portable ultrasound also features an elegant outline, 12” angle adjustable LCD, two transducer sockets, premium B/W ultrasound technologies, abundant software packages, and professional veterinary transducers. In addition to its powerful, full digital beamformer, some of the imaging technologies associated with this vet ultrasound include tissue harmonic imaging, B, B+B, B+M, M, and 4B. As a budget imaging machine, this does a nice job for small animals. Additionally, it has a linear transducer for bovine/equine fertility applications. This is among the more versatile veterinary ultrasounds because of its transducer capabilities and imaging capabilities.